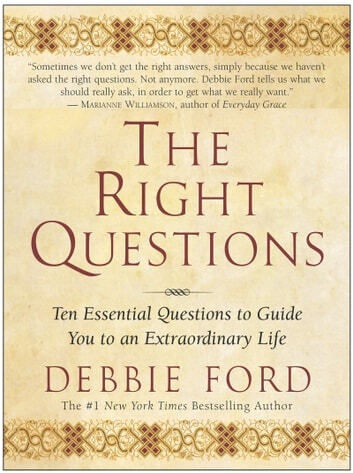 New York Times number–one bestselling author Debbie Ford presents revolutionary questions that, when answered with complete honesty, change the way we see ourselves and make decisions – ultimately moving us toward the life we desire. The realities of the life we live today are a result of the choices we made yesterday, three months ago and three years ago. But we don't wind up $50,000 dollars in debt because of one extravagant purchase. Nor do we put on 30 unwanted pounds as a result of a couple of decadent meals. And our relationships certainly don't fall apart overnight because of one decision. We are where we are because of repeated unconscious choices made day after day. If we want to understand why and how we created our present day reality, all we need to do is look at the choices we made in the past. Ford cuts right through our denial with the 10 questions that immediately reveal the true motivations behind our thoughts and actions. But more than that, by rigorously and honestly asking and answering these 10 vital questions, we regain control and have the power necessary to create the life we always wanted. 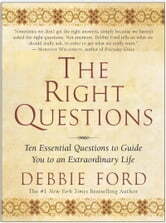 As soon as I read the questions, even before I got into the book I was inspired. It got me thinking straight away and helped me change directions on certain things that were nit in my highest interest. Great book! The Right Questions are illustrated with real life examples and serve as a great reminder to take a step back and ensure you are aware and in the moment before making decisions - all decisions.